I popped down to day one of my friends Cami and Nadia from Discount's massive studio sale on the weekend. It was great to see their work in person, and to see how much the studio had changed since my last visit back in March. The sale was amazing, lots of great unique and one off pieces as well as their staple items such as their logo tees and tote bags. Emman picked up a Discount logo tee and tote bag. If only I could still walk in heels I would have bought a pair of these babies. Studded pieces, sheer lace dresses embroidered with dollar symbols oh how I want thee. 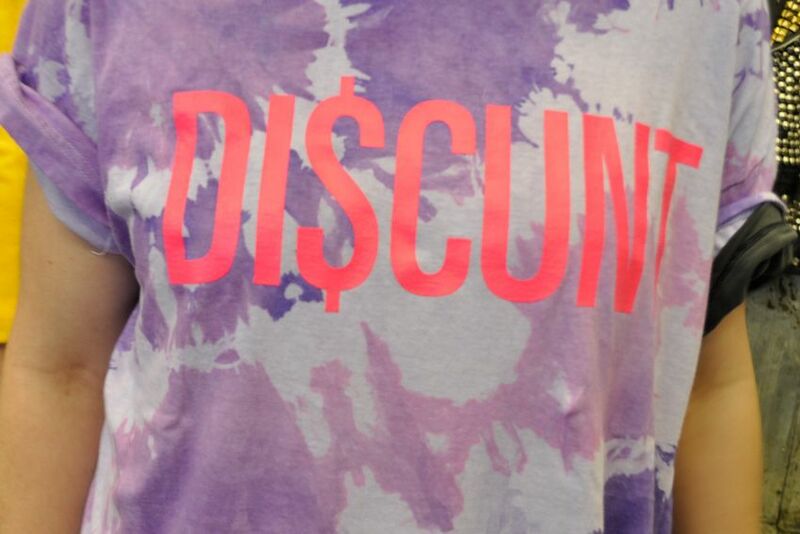 A ubiquitous Discount logo tee. The sale continues tomorrow at Level 3 34-36 Block Place in the city. Block Place is the Little Collins Street laneway entrance to The Block Arcade, once there look for the small staircase between a cafe and a jewellery shop, it will be the one with Discount Sale signs!!! The sale is a must see!!! I feel so ... so.. unaware and so disappointed I missed this while I was in melbourne last week! This post is killing me - I love every piece. The OTT-ness of it is just incredible. Wow... it looks so amazing, I want to go tomorrow so badly but I'm scared that as soon as I walk in I'll feel very intimidated and awkward =/ and 2. I doubt I'll be able to afford anything haha. Goodness - I wish I were in Melbourne so that I could check it out! I love all the colours and customisation - I know that each piece would be able to tell an amazing story. i wish i were in melbourne to grab the eyeball bustier. please, wont someone buy it and send it to me?